Mark Bennett is likely to miss Scotland's autumn Tests as he faces "months" on the sidelines, says Edinburgh head coach Richard Cockerill. The centre, 25, suffered a suspected ruptured hamstring in Edinburgh's late loss at Ulster last week. The former Glasgow Warrior, who has 22 caps, is awaiting the results of a scan but Cockerill expects a long lay-off. "Clearly it is something quite significant. If it is completely ruptured it's serious," Cockerill said. "If it is what we think it is, it will be months." Bennett was sidelined for almost a year, including the first four months of last season - his debut campaign at Edinburgh - with a knee ligament injury sustained on Scotland duty in March 2017. "Thankfully it's nothing to do with his knees," Cockerill added of his latest issue. "People recover from hamstring issues and, as severe as this one is, he will hopefully be fit for the New Year, give or take - we'll see." Cockerill is also likely to be without back-row Viliame Mata for Friday's Pro14 match with Connacht at Murrayfield. 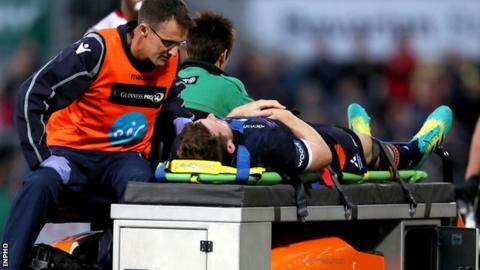 The Fijian number eight injured a shoulder against Ulster, but Scotland flanker Hamish Watson is available again after missing the Ulster game to attend the birth of his daughter.